Actually, it was back on February 24, 2013 that Dr. Juanita Lewis presented this award to NIKOtheOrb. I have been on a bit of a hiatus throughout that time (but have been, of late, contributing to EXPLORINGtheLATERAL, if you’d like to see some of what we’ve been up to). My apologies for taking some months to thank The Metaphysician (a great blog, by the way, and if I could, I’d add her to the list of 15 blogs the rules require I appoint). 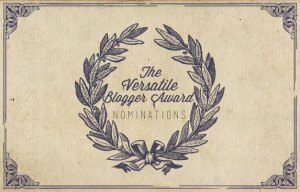 In reading through your blog, the list of other appointed blogs to whom you bestowed this (well-deserved for them all, if you ask me) award, and the many comments and compliments you received, I am humbled to be among such great company. 9. Walking No Line-–Wandering here and there, wondering at this and that, trying to find my Way. 12. rarasaur—. . .frightfully wonderous things happen here. 14. Mind Hacks—Neuroscience and psychology tricks to find out what’s going on inside your brain. 1. I live with SchizoAffective Disorder and Obsessive-Compulsive Disorder. 2. I spend nearly everyday in the woods, walking barefoot, breathing in the trees and the soil. It’s how I keep my sanity. 3. I don’t know the names of many of the animals and insects I see in the woods, but I know much of their behavior and habits. 4. I produce and edit a nature show on YouTube (and EXPLORINGtheLATERAL) exploring our adventures in the forests, particularly hard to witness activity with birds, insects, chipmunks, snakes, turtles, and the like. We’re right down on the ground with the animals. 5. My favorite number is the Fibonacci Sequence. 6. I love to watch old science fiction films like Metropolis and THX 1138. 7. I am fortunate enough to spend every moment of everyday with my boyfriend, just hanging out.